A brief Mardi Gras rundown. 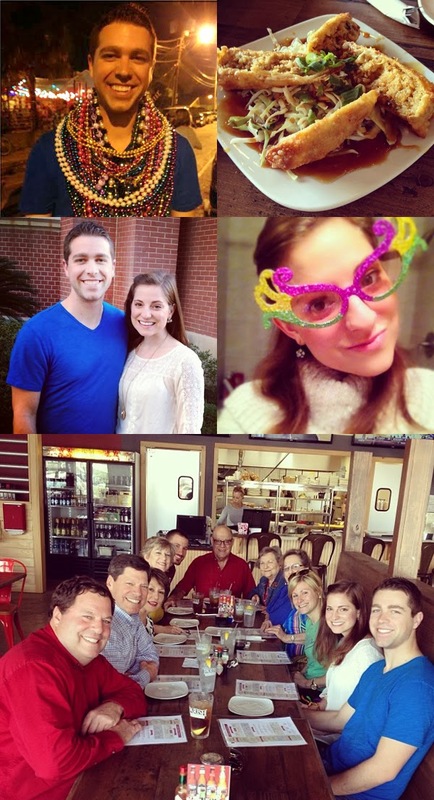 I experienced my first real Mardi Gras celebration this past weekend, y'all. Scott accompanied me and the rest of my family to Lafayette for the first time, where he got to meet an overwhelming number of curious grandparents, aunts, uncles, and cousins—all of whom instantly fell in love with him. (No surprise there.) Saturday afternoon, after a relaxing morning on the farm, we hit up my cousin's new restaurant and stuffed our faces with delicious boudin egg rolls, crawfish étouffée, and fried shrimp. And I may have devoured a rather large slice of chocolate cake all by myself. Seriously though, the Cajun cooking is to die for. (We're so proud of you, Mark!) Once our food had settled, we waddled our way to Jefferson Street to grab a few drinks and wait for the Mardi Gras parade to begin. Jason, Scott, and I carried on a bead-catching competition for the next two hours, and embarrassingly enough for me and my brother, the non-Cajun was the one who left with the most beads around his neck. As fun as Lafayette was, I'm crossing my fingers for New Orleans next year... (You can't beat a New Orleans Mardi Gras.) But for now, I'm looking forward to experiencing all that the Lenten season has in store. Only four more hours to go!